I woke up in my hotel room, almost forgetting where I was. Sometimes I worry that sleeping in a bed will be too comfortable and I'll have a hard time sleeping, as I've gotten quite used to reclining in my car and putting my feet up on the dash. It was rainy and cloudy outside, so I decided I would not make the drive back South and try to see Mount Rushmore. Hopefully, I'll have the opportunity to see it in the future. I feel really fortunate I was able to see the Crazy Horse Memorial before the weather turned sour. By the way...I forgot to mention this in my previous post - if I can give you a sense of the immensity of this Crazy Horse Memorial project...look to the immediate left of Crazy Horse's face - in that area (the brownish rock - which will eventually become his hair) you would be able to fit all four heads of Mount Rushmore. That's how big this thing is going to be. Before I left Rapid City I began a search for a Native American art store that I saw a billboard for miles away. I remembered the address and got there shortly after it opened. The place was enormous...much bigger than I anticipated, and it had all kinds of artwork for sale...paintings, jewelry, beads, etc. Even items that were handmade by non-Native Americans. I spent some time on the 2nd floor which was the art gallery. There were beautiful paintings for sale (some $5000+) and prints, as well. I found a display of an artist, Don Montileaux, whose work was also on display at the Crazy Horse Memorial store. At Crazy Horse I was drawn to a particular print of his on the wall called "Chief's Blanket." Unfortunately, no more prints were in stock and the one on the wall wasn't for sale. Dejected, I left, not thinking I'd see it elsewhere. By a strike of luck, the exact print was available in this store in Rapid City. I also was able to meet the artist since his studio was in the same building. Don is a very nice guy who was willing to spend time talking with me even though I know nothing about art. He explained to me that he is Oglala Lakota - the same tribe as Crazy Horse. I had been hoping to bring something Lakota-related home, but hadn't found anything until that print. I thanked Don, he gave me his card, and I went downstairs to purchase the print. When I get back home I'll have it mounted at the Garland Gallery (Colleen - check my mail for a 10% off coupon). I left Rapid City and headed East across I90 which runs across the entire state of South Dakota. 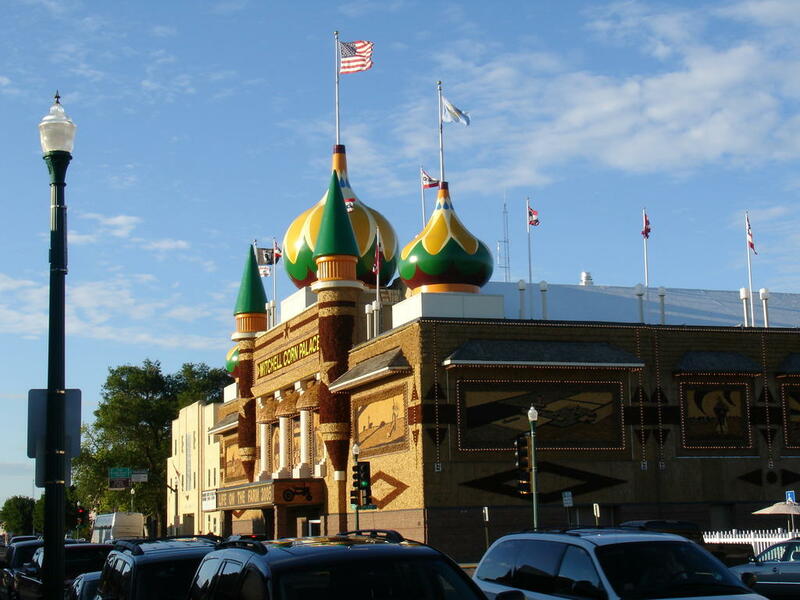 Along the way was the famous "Corn Palace" in the city of Mitchell. I guess it's a place made entirely of corn. Inside there was a museum of all different South Dakotan things. I wasn't exactly enthralled by the place, but I figured since I was out here I should see it. Anyhow, I continued East into Minnesota and found a rest stop to spend the night. Tomorrow I'll head into Iowa, and I should be able to reach Illinois before evening. As the end of July draws near, I'm getting more and more anxious to return home. Yes, I've become quite comfortable sleeping in my car, and it's fun being out on the road, but I look forward to getting back in my own bed, and not having to drive so much on a daily basis. But all the driving has certainly been worth it.